LOS ANGELES -- Former rap mogul Marion "Suge" Knight pleaded not guilty Thursday to allegations that he threatened to kill or seriously injure the director of the film "Straight Outta Compton." 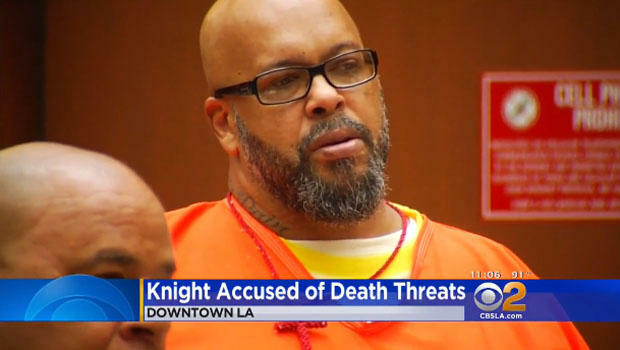 The Death Row Records co-founder appeared in court in Los Angeles after being indicted on criminal threat charges stemming from an August 2014 incident when Knight allegedly threatened the film's director, F. Gary Gray. The 2015 biopic focused on the rise and fall of the hip hop group N.W.A. and Knight is depicted in the film as an influential figure in the rap movement in Compton in the late '80s and '90s. One of the group's members, Dr. Dre, left N.W.A. after he hired Knight as his manager. The two later founded Death Row Records, which fueled gangster rap's popularity in the 1990s and its roster included Dr. Dre, Tupac Shakur and Snoop Dogg. Knight lost control of the company after it was forced into bankruptcy. Knight's attorney, Matthew Fletcher, told reporters that his client had been in negotiations with Gray and was seeking compensation for the use of his likeness in the film. The indictment against Knight alleges he made specific threats against Gray that conveyed "an immediate prospect of execution," leading Gray to fear for his life and the safety of his family. Fletcher said Knight denies threatening Gray. "There is certainly no evidence he sent any texts threatening him," the defense attorney said. Knight remains jailed and is awaiting trial on an unrelated murder charge filed after a 2015 incident in which he ran over two men outside a Compton burger stand, killing one. His lawyers have said he was fleeing armed attackers when he struck the men. Knight, 52, was ordered held on $1 million bail, said Ricardo Santiago, a spokesman for the Los Angeles County District Attorney's Office. He is due back in court next week.